Who are the Magic Makers? Magic Makers are Old Mill Center’s sustaining donors. Why become a Magic Maker? Recurring gifts provide a steady stream of support. Smaller monthly gifts (as low as $10/month) won’t make a dent in your monthly budget, but are invaluable to our programs. Set it and forget it: once you sign up, our secure service provider takes care of the rest, making it easier than ever to give each month. As a Magic Maker, you’ll receive a monthly newsletter with news and stories showing the impact of your gift. You will also be the first to hear about upcoming events and new programs at Old Mill Center. And you’ll be listed as a Magic Maker in our quarterly print newsletter. 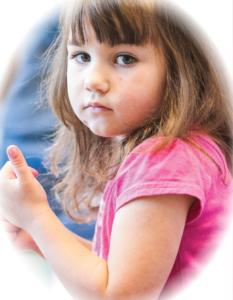 When you become a sustaining donor, you’re providing vital assistance to some of our community’s most vulnerable children and families. Here are just a few examples of what your money can do for the families in our programs. When you sign up as a recurring donor, you’re not just helping sustain our programs. You’re actively preventing child abuse and giving kids like Sophie the chance to learn, grow, and thrive in a safe environment.